Look great almost instantly when you wear one of women's pullovers. 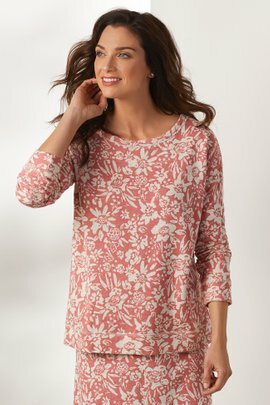 Soft, warm, and always stylish, these sweaters and tunics are appropriate for most occasions. Even better, they are incredibly versatile and pair equally well with jeans, leggings, and skirts.Whether you are hoping to just enjoy a cozy day or evening at home, or need to run out for an errand, you probably don't want to spend a lot of time putting an outfit together. That's why our pullovers are so popular: One top to keep you warm and looking fantastic. Of course, everyone has different tastes, which is why our women’s pullovers come in so many styles, fabrics, and colors. As you've come to expect from Soft Surroundings, many of our tops and tunics incorporate exclusive details, such as embroidery, beadwork, and special washes. There's nothing ordinary about this collection.Softness is also a priority, so each one of our pullovers has been given a softness rating. Browse our collection and choose something wonderfully warm today.